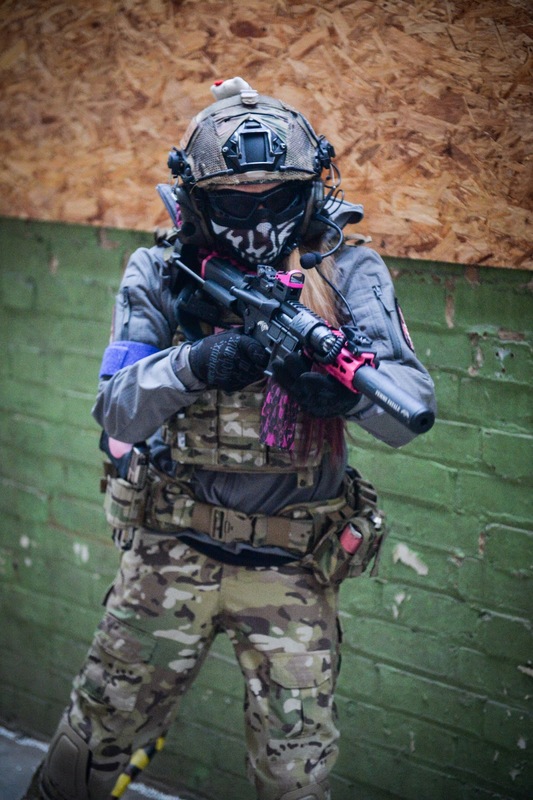 LADIES AIRSOFT KIT - TACTICAL TROUSERS! Following on last months feature on ladies protective gear for Airsoft, this month I’ll be running through some of the tactical trousers - both unisex and women’s cuts that work for me. Unfortunately, there aren’t a lot of female tactical trousers out there so this list is a culmination of over four years of trial and error but I’ve finally found 4 pairs that not only give great fit but can stand up to the stresses of the sport. First let’s start off with the Viper unisex elite pants! I first used these pants all the way back in 2015, I was looking for a pair of adjustable trousers in Multicam that had built in knee pads, that were also under £60 and at just under £40 these fit the bill perfectly. They are made from a mix of Polyester ripstop and cotton which is not only comfortable but is quick wicking and feels strong/durable. The most important factor for me is of course fit and as they are made in sizes 28” all the way up to a 42" inch waist, they are really inclusive of different sizes. I chose the 28” waist (my waist actually measures 29” but they have a little give) and I was pleasantly surprised when I first tried them on as they fitted me really well, not only around the waist but they didn’t look baggy around the bum or knees - this is because they have some great features that make them completely adjustable including a Velcro/zipped fly, elasticated waist adjustment, internal kneepad adjusters, a velcro knee retention strap and an adjustable velcro ankle fastener. As I’ve said, the Viper V Cam Elite pants have built in neoprene lined ABS removable knee pads.The built in knee pads on the Viper Elite pants are easy to take out and pop back in and even have Velcro to keep them in place. After a while the velcro does get a bit worn so they have a tendency to pop out but this is easily replaceable. In regards to aesthetics the Viper V Camouflage is very a crisp and colour saturated camo similar to BTP/MTP. The trousers also have a plethora of pockets for storage, ranging from the two front hand pockets that house the internal knee pad adjusters, two back pockets, two expandable thigh pockets, two expandable cargo pockets and lastly the two ankle utility pockets making them a practical and useful piece of kit to wear on the field. The Viper Elite Pants are available from Military 1st and of course Viper themselves, for around £40. Next up we have the Emerson G3 unisex combat pants, which are a budget version of the well known Crye Precision combat pant design. They are constructed from a poly/cotton blend fabric, are fully adjustable at the waist, knees and at the legs by velcro tabs. I found these at the end of 2015 when my Viper Elite Pants were damaged in an airsoft accident and I needed a new pair of tactical trousers with knee pads to protect my knees from scuffs and what not during games. The detachable knee pads are made from a rubbery material that has is easy manipulated but still offers the level of protection airsofters need in the field. I prefer these kneepads to the plastic versions as they mould to the knees better. They also have a load of pockets to keep all your gubbins in, including : two front pockets, two rear-zip pockets, two velcro tab cargo pockets with a small pocket inside, two velcro tab small pockets on upper legs and lastly two velcro tab small pockets on bottom legs. They’re a unisex size, but because they are a brand from Asia the sizing is a little bit smaller than UK and US sizing. I chose a 30” waist and they were comfortable around the waist thanks to the low profile waist adjustment system, and didn’t look baggy around the knees. They are a bit shorter on the legs than most brands of trousers which for me isn’t a problem being 5”4 but for ladies taller than me it could be a bit of an ankle flasher situation. The knee pad adjusters means that the kneepads are always in the right place. They’re available in sizes 30 - 38W from Army Panda for between $53-55 depending on what camo option (which is around £41 at the current exchange) and they are available in SO many camo options which is my favourite thing about these! They’re available in MultiCam, black MultiCam, US woodland, grey, MultiCam Arid, MR, AOR2 and A-Tacs FG so there are loads of options no matter what loadout you decide to run. Next up is the Helikon Tex Women’s Urban Tactical Pants, which are a pair of durable, lightweight field trousers that have a specific women’s cut. First things first, with these trousers it is really important to measure your body and check the sizing, In mens/unisex combat trousers I would usually wear a 28" waist, 32" leg and they do the trick but as these are an extremely fitted pair of trousers I had to measure my waist and hips to make sure I had the correct size. I'm a size 8/10 in most jeans/trousers etc and worked out my size to be a 30" waist. I was very impressed with the feel of the material, it doesn't feel or look cheap - has a little stretch to it and is a durable 2 way rip stop blend fabric - perfect for the field. Looking at the overall construction of the garment it was solid and with this I threw them on so let's check out the fit. So these are designed specifically to fit the anatomy of the female form and have a classic jean neck shape to prevent the trousers from slipping down. I am very happy with the fit, they are comfy and not too restrictive. After putting these through their paces off the field with squats, running during my daily fitness routine for most activities, especially for range days the size is perfect however if I were to wear these for an Airsoft game I would probably opt for a size bigger because I like my trousers to be a little looser to enable a better range of movement especially when I'm crawling under/climbing over or through obstacles to get those kills on the field. The trousers are very fitted around the waist, hips, buttocks and thigh areas and loosen up around the knees. The length of the trousers is 34" no matter what size you opt for and this is to give the user greater freedom in choosing their leg length - just fold them up and you're good to go. They feature a elasticated waist and zip/velcro fastening which gives them a little movement around the waist and keeps them securely fastened. There are 7 wide belt loops which are perfect for loadout belts for holsters, mags etc. I feel pretty confident when I say that it is unlikely that you would need a belt to keep them up as they are very form fitting. They also come equipped with 12 pockets - two front pockets with strengthened edges, two wide back pockets, two slim back pockets for accessories, two angled internal waistband pockets, two zipped thigh cargo pockets and two velcro thigh pockets. The women’s UTP come in 4 colours - shadow, black, khaki and olive drab. Lastly, let's talk prices. The shadow colour-way is available from Military 1st for £53.00 with free shipping. And lastly, the First Tactical Specialist Tactical Pants. 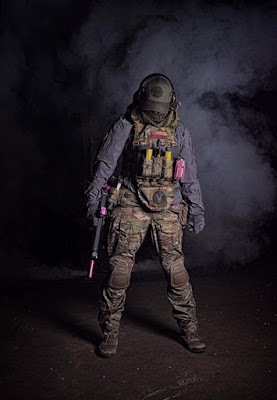 These are a durable pair of tactical trousers that are made specifically for women in the field, whether that be the range, airsoft, outdoor activities and even first response work. The pants are made from a double ripstop poly/cotton blend fabric that has the Teflon® Shield+ stain repellent finish to keep them looking fresh even in harsh conditions, this combination gives the end user sturdiness and functionality. My favourite thing about the First Tactical range of trousers is the feel of the fabric used – as soon as you get them out of the packaging, it feels smooth, sturdy, tough and ready for any task. In regards to the construction of the pants, from my experience First Tactical always do a fab job. The running gusset construction gives the user full motion ability, whilst the triple needle stitching at critical seams keeps the pants going strong and together even after harsh use. The pants have double layered knees for durability and internal knee pad access that can be used with the First Tactical knee pads (to be purchased separately). The pants have a multitude of pockets including two back pockets, two front pockets, two front slit pockets (for mobile phones and magazines) and two organiser pockets (that can hold M4 magazines) with laminated pocket flaps. The pocket flaps are laminated to make sure they stay down and that the pants have a professional look even after being worn, they fasten with hook & loop Velcro and can be tucked in for quick access functionality. The Specialist Tactical Pants are available in the UK, in US sizes 2, all the way up to a size 20 in both a regular and tall leg – it is worth noting that the sizes on their website are American sizes but they do have a size chart for reference. I usually wear a UK 8 so opted for the US 4 with the regular leg. In regards to fit, the pants have the First Tactical Advanced Women's Fit which is designed and constructed uniquely for a woman's shape – it has contoured cut curves that give a better fit around the hips, buttocks and upper leg to allow for optimal freedom of movement – they aren’t too tight but give the movement you need for strenuous activity without being baggy. As they are a women’s fit the waistband on the pants sits just above my hips rather than on my waist unlike most tactical trousers – which is much comfier. Overall, I’m really happy with the fit! The pants are available in limited colours – navy, black and khaki. This is my only complaint about them, that they aren’t available in the same range of colours like the men’s trousers are. I would absolutely LOVE a pair of these in Olive Drab Green! As for price, the pants retail at £44.95. Overall, I really like them – they are a sturdy, durable and fitted alternative to traditional BDU trousers. They fit well and are a reasonable price, but I would love to see them in more colours! 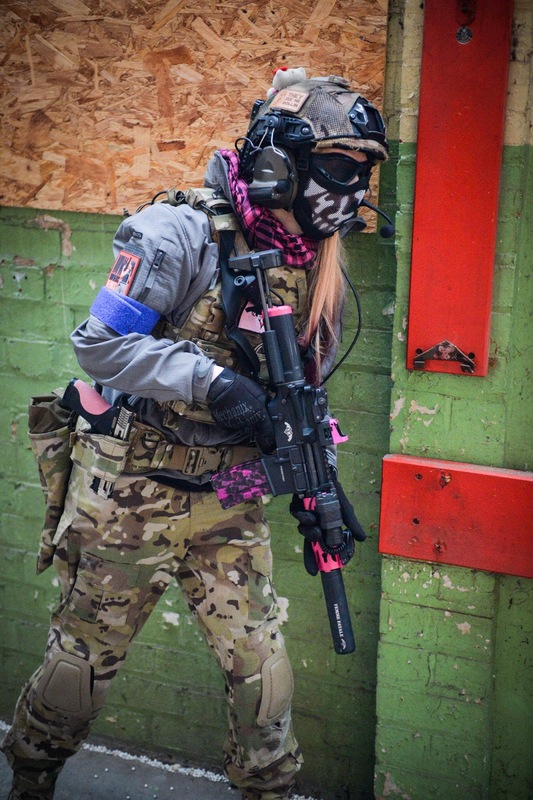 Of course there are other trousers out there that are made in a specific female cut, and unisex cuts that will also work for many of the ladies out there, these are just four of the best that I’ve tried over my time in airsoft. It is my hope for the future that more companies will make tactical clothing for women! Hardwick, K. (2018). 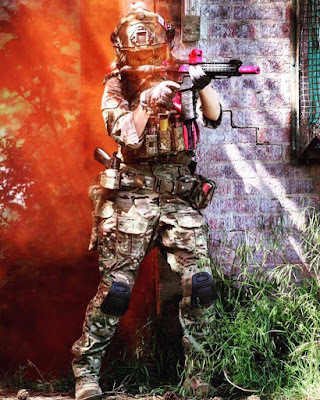 LADIES AIRSOFT KIT PART 2 - TACTICAL TROUSERS. Airsoft Action. 82 (Xmas), 34-37.